Recently, my travels took my back to Helsinki, in Finland, also called the “White City of the North“. I loved Finland for a long time now, ever since I prepared and published a full student newspaper on the country. 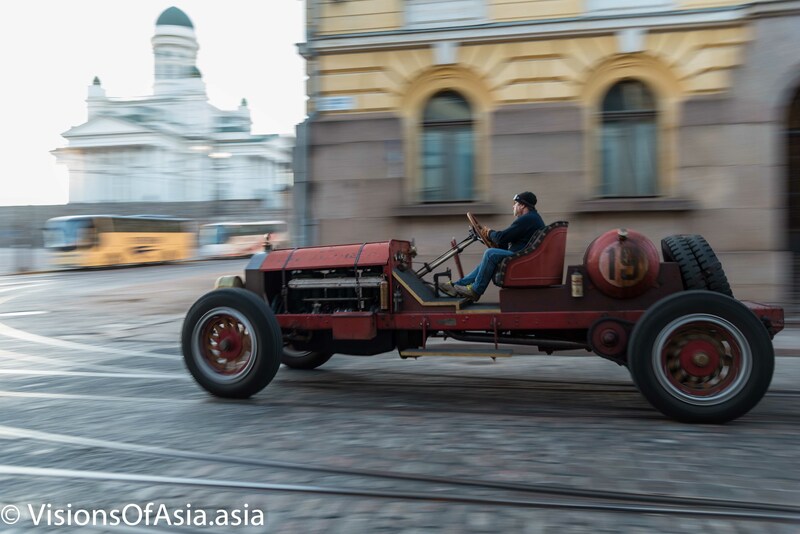 Visiting Helsinki last year was another occasion of appreciating the real country. To fly to Helsinki, I was lucky enough to be able to use the business class of Finnair. While being somewhat bare bones (amenities are few except a Marimekko pouch), the comfort is pretty ok. As I was gold member of Finnair, I managed to take my family to the Qantas lounge. Later, however, my wife and daughter were flying in economy, while I was flying business. The presentation and taste of the Finnair food is quite good, although I will confess that Turkish Airlines does make better food. The whole flight was uneventful, and we arrived at around 6 AM in Helsinki. Passing through immigration was also a breeze, and eventually we collected our luggage. The best option for reaching the center was taking the Finnair bus which has its terminus at the central train station of Helsinki. We then had to walk a few hundred meters to reach the hotel, but it was tough, as we had to drag our suitcases. 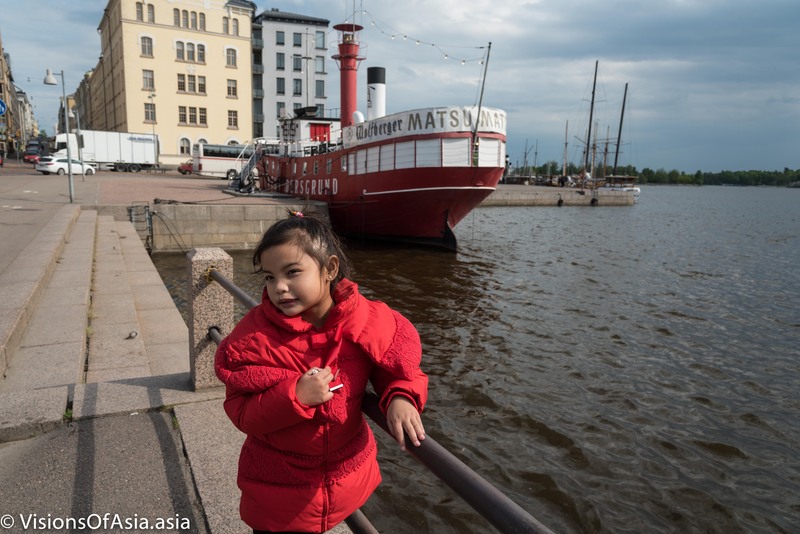 As this time, my wife and daughter had accompanied me to Finland, I decided to reside in the center of Helsinki. 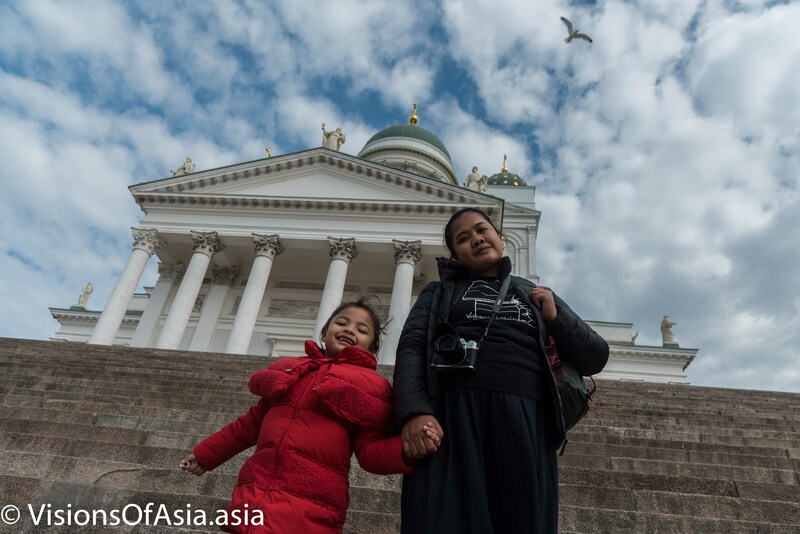 Ever since my first trip, they had wanted to come and see the lovely city of Finland. We stayed at the Glo Hotel Kluuvi. This hotel is very centrally located and for our requirements, it perfectly fitted the bill. Upon check-in, we were offered the option to upgrade to a suite for 165 € for the three nights (vs 165 € per night). We seized the option and got into a lovely room with the reputed Finnish design. However, as it was only 6 AM, we had to leave our luggage at the hotel, and we decided to already go on a first tour of the Finnish capital. Excitement among the two girls was at its top. Later, walking in the old city, we enjoyed the old cobblestones, sharing the road with trams and simply walking along the city. 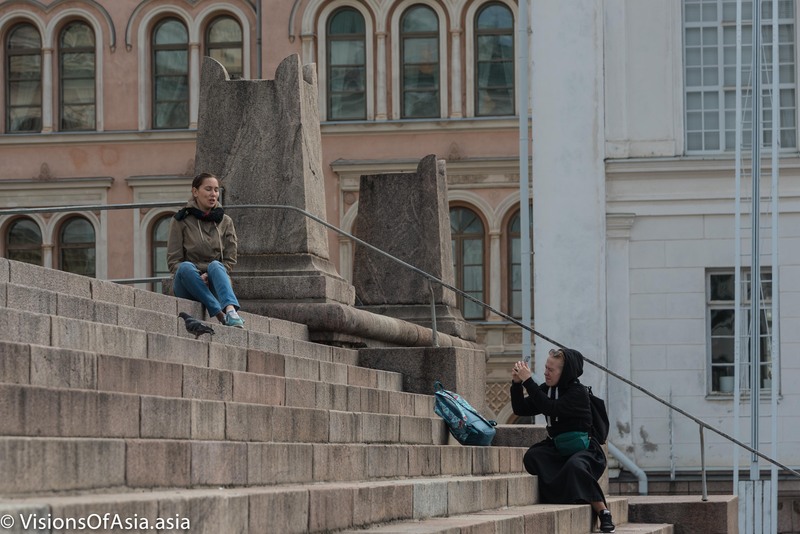 The best part being probably have their portrait taken on the steps of Tuomiokirkko. Tuomiokirkko is always a favourite place for portraits. 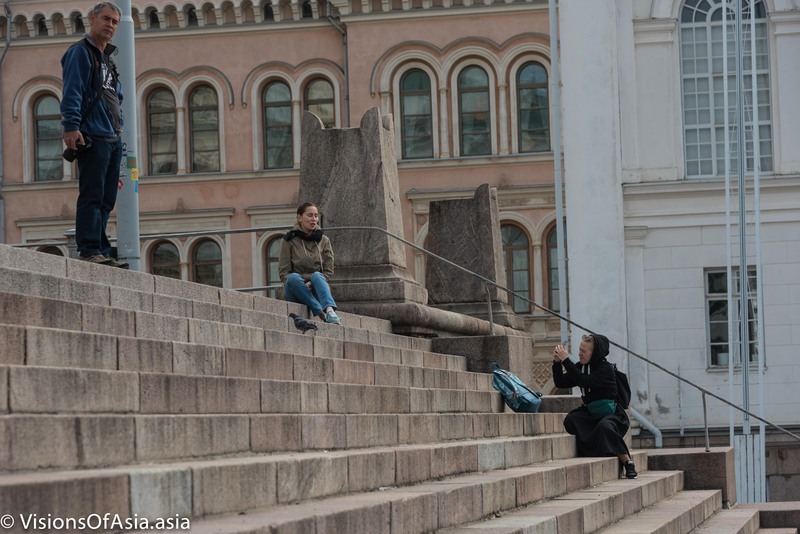 Two girls were also shooting on the steps. Maria-Sophia does some child modelling. As such, she was happy to pose in her warm outfit of Nicholas and Bears (which she already sported in Japan). 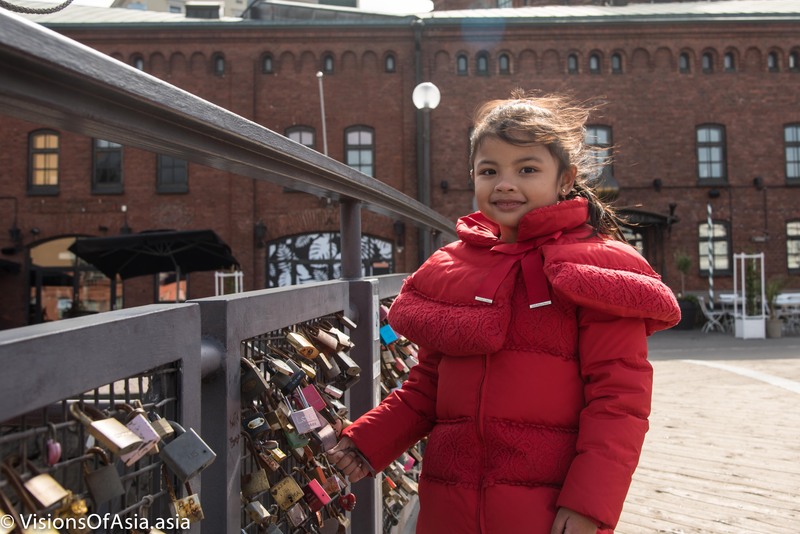 Near the Orthodox Cathedral of Helsinki, Maria-Sophia poses on the padlock bridge. The red ship in the Helsinki habour echoes nicely her outfit. At that point, between jet-lag and tiredness of walking around, our daughter was already exhausted… I then offered to carry her on my shoulders, thus starting a new habit for her. But walking in the historical center already gave us a taste of the beauty of the city. The weather was also quite temperate. Finland is very liberal in the matters of drone laws. 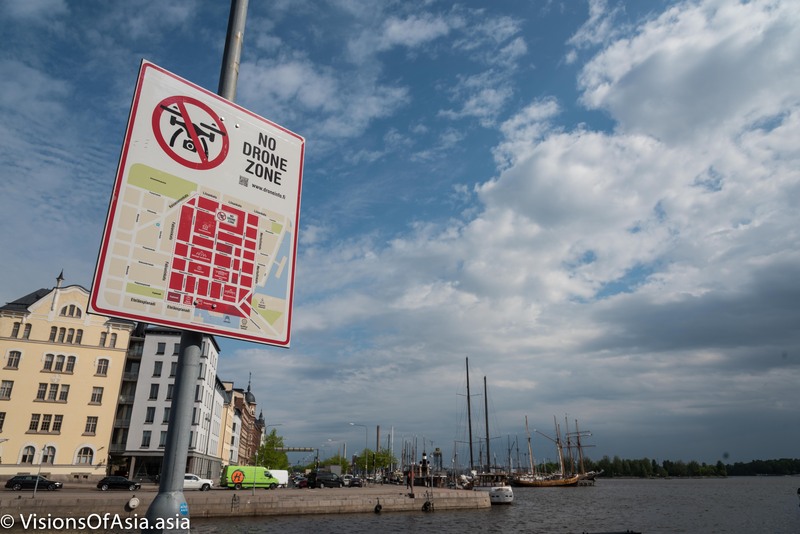 Nevertheless, they have a few “no drone zone”, and one of these encompasses Tuomiokirkko and the historical center. This is a pity, as the center of the city is very photogenic, but was implemented because of the presence of government buildings. 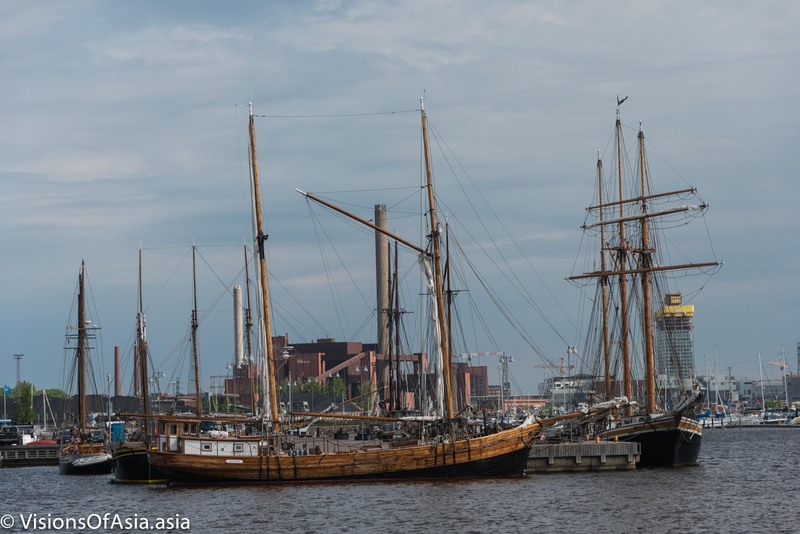 The eastern part of Helsinki harbour is interesting for the wooden yachts moored there. This little early morning and afternoon stroll gave us the feeling that Helsinki is the one city where I would love to live. It has a perfect mix of architectural beauty, perfect weather, and “joie de vivre” that makes it so lovely. 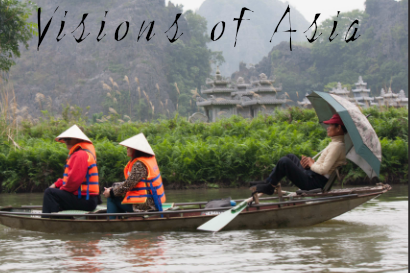 Even though as tourist, you don’t put up with most of the daily issues of locals, you can tell that people are happy. And the sheer beauty of seeing the sunset at midnight in summer is enough to get you excited (even if in winter, you almost never see the sun!). Later, at night, I went out for a barefoot walk with my drone. The streets are quite easy to walk barefoot, but if you go into the Kaivopuisto park, you must beware. The whole park seems to be a gigantic toilet for dogs, with pieces or dried excrement all over the grass. Something of annoying for what is otherwise a lovely place to be. A famous statue, the Rauhanpatsas statue of peace faces the South harbour. When you walk beyond the immediate proximity of the south harbour, you can come across a magnificent jetty which provides a lovely view in the setting sun. All in all, the lovely evening stroll and the beauty of the environment contribute to make you love Helsinki and wish to come back. The statue of the three smiths just in front of Stockmann department store. 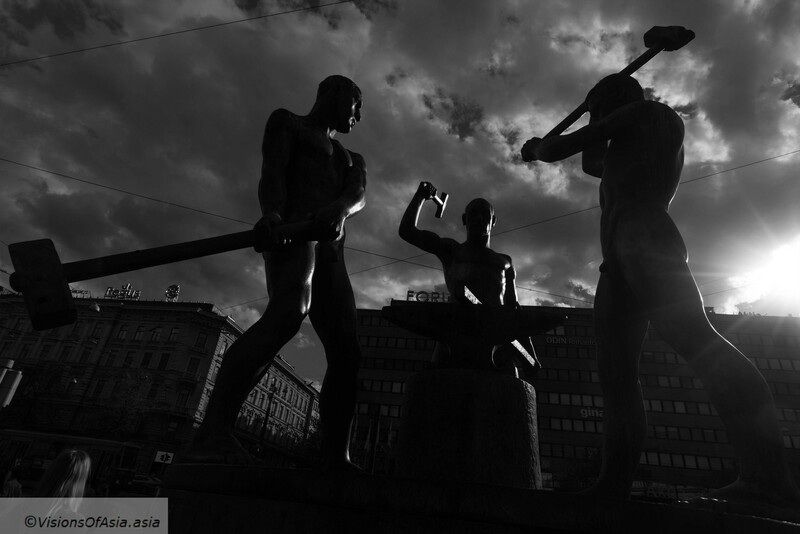 In Helsinki’s center, a famous landmark is the “three smiths” statue. 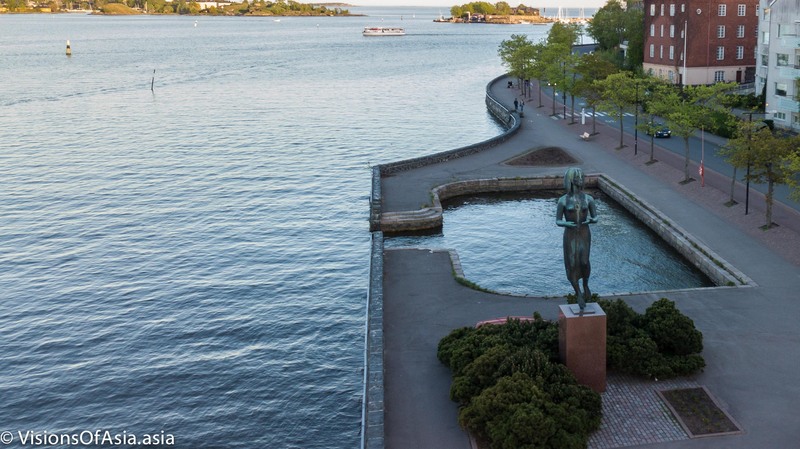 A donation by a private foundation, this statue (called Kolmen sepän patsas in Finnish) was created by the sculptor Felix Nylund in 1932. 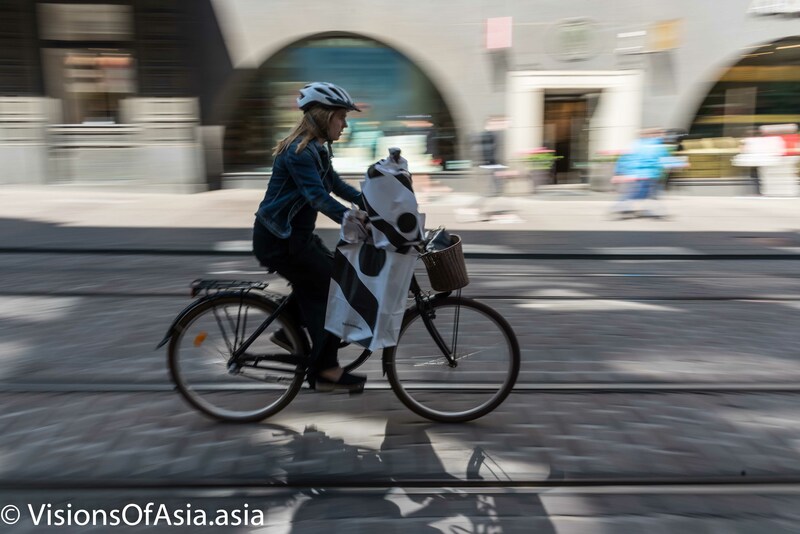 Today, it has become one of the main points of recognition of Helsinki, where it stands just near to the famous Stockmann department store. You can see some damages on the statue from a bombardment from the Continuation War of 1941. A reminder that Finland’s life has not always been easy in its struggle for freedom from Russia. 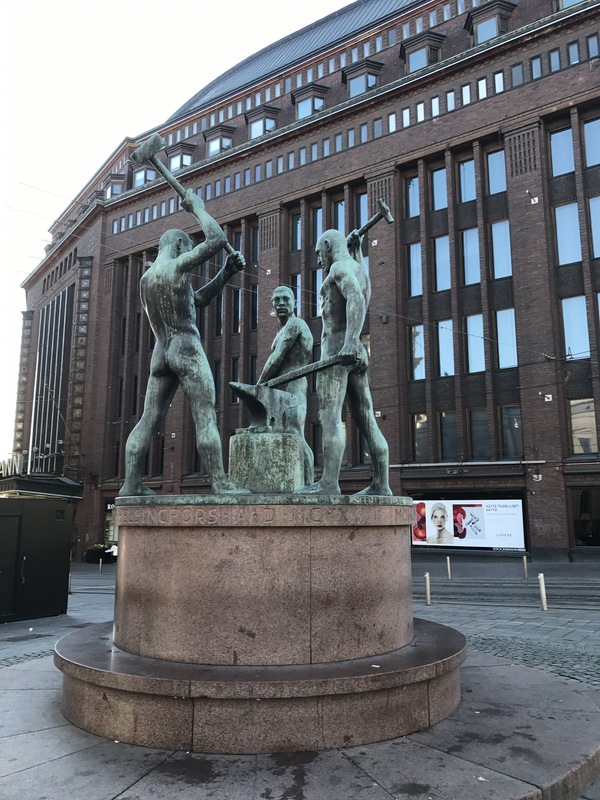 The statue is situated in front of the department store Stockmann, and is just a walking distance from the Central Station. 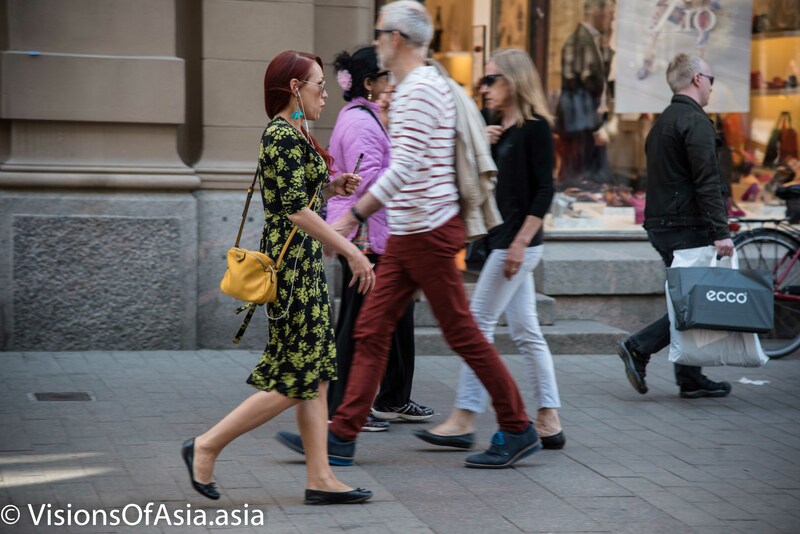 A recent trip was the occasion of dropping by the Finnish capital, Helsinki. Often unknown, even among Europeans, the other name for Helsinki is “the white city of the North”. 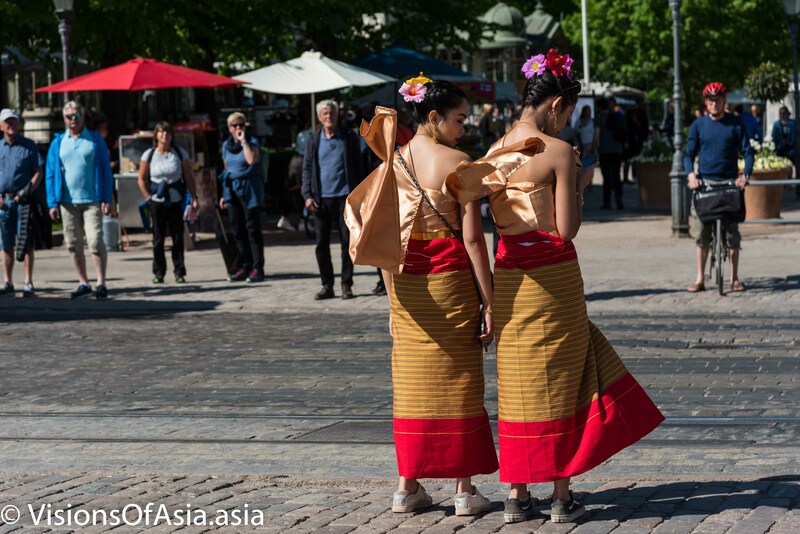 The Finnish capital has a vibrant atmosphere and culture which impregnates the whole city. 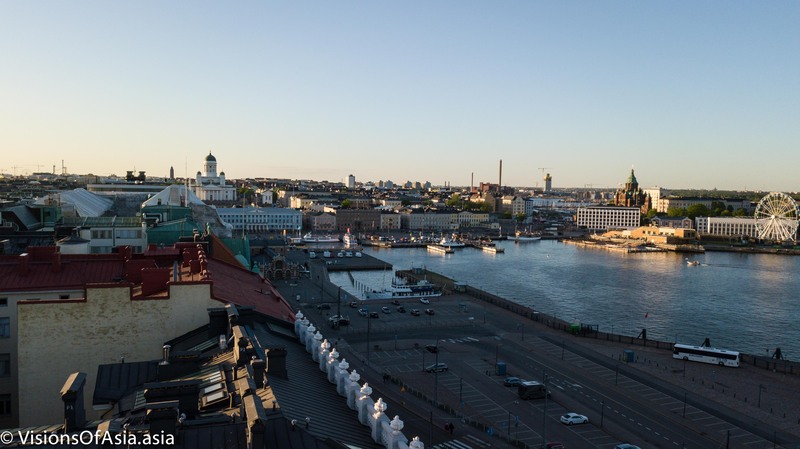 From its iconic Tumiokirkko, to the statue of the three smiths in the center, Helsinki is replete with sights, culture and a lovely architecture. 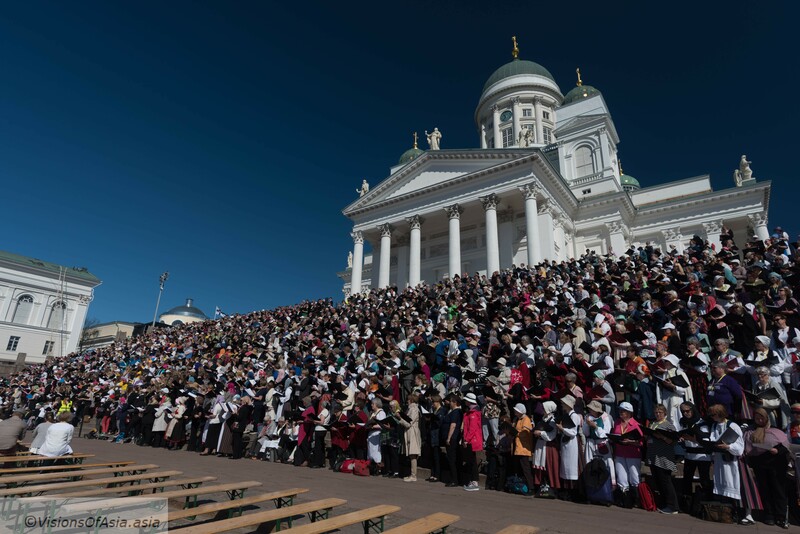 During my visit, they even had a mass choral before Tumiokirkko (see featured photo), with an incredibly blue sky. Tumiokirkko is also known and the Lutheran Cathedral of Helsinki and is one of the landmarks of the gorgeous Finnish capital. 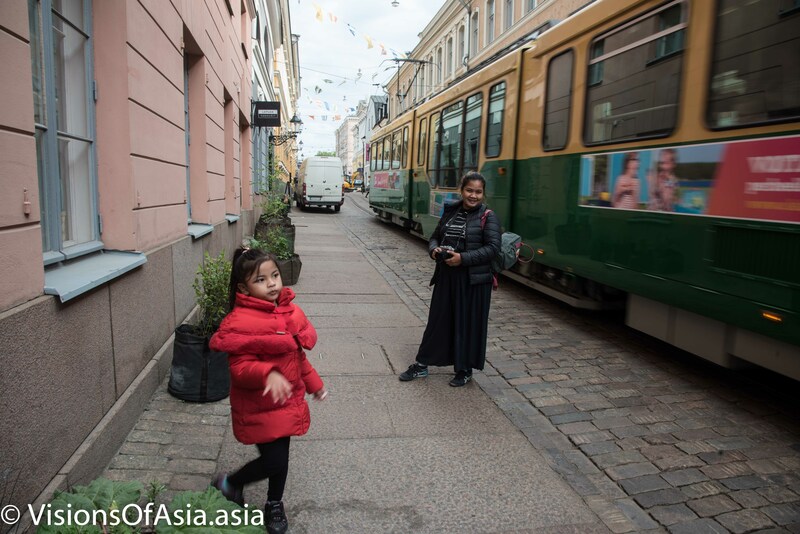 But Helsinki has something else that makes it even more lovable. 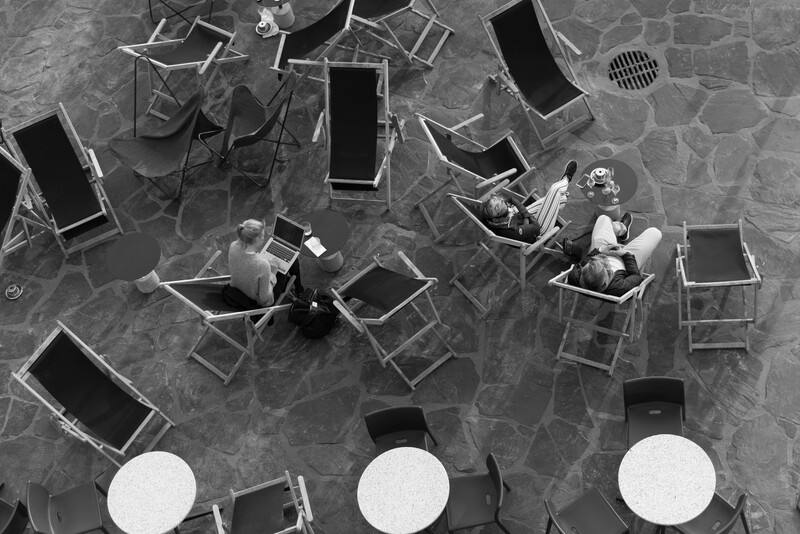 For being a Nordic capital, it has a truly laid back culture and inhabitants seem keen on enjoying life as, for example, enjoying cafes even when it is as cold as 12° C outside. By 12° C, Finns are enjoying a drink in the harbour of Helsinki. When visiting Finland one must also pay attention to their impressive culture, and in particular their main work developed in the XIXth century, namely the Kalevala. An epic poem written by Elias Lönnrot after collecting oral tradition from the region of Karelia, the Kalevala is still very much at the foundation of the Finnish national spirit. 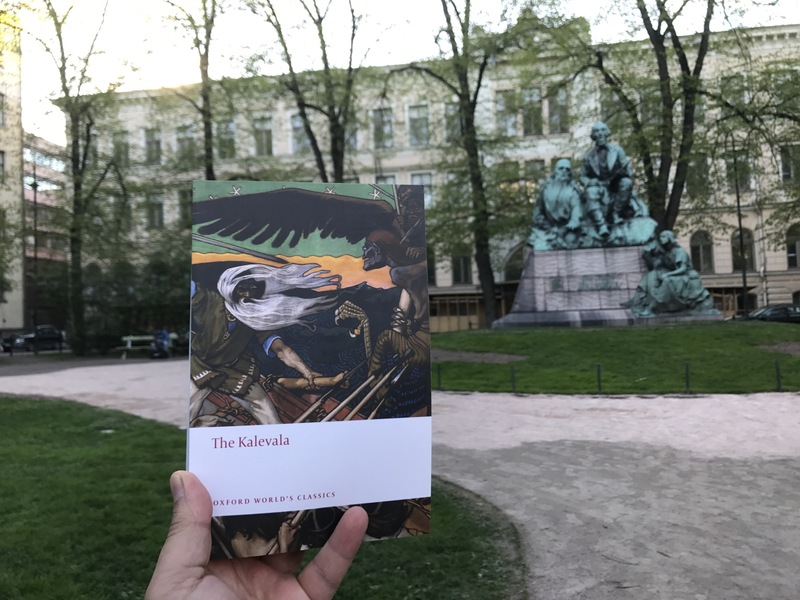 A copy of the Kalevala in front of the statue of Elias Lönnrot in Helsinki. In a somewhat ironic twist of history, nowadays, Russians are trying to surf on the Kalevala myths and history for tourism, as the greater part of Eastern Karelia has been occupied by Russia during WW II. Still, the Kalevala is very much a Finnish work and only Finns can truly talk about it in full knowledge. Culture is very important for Finns. 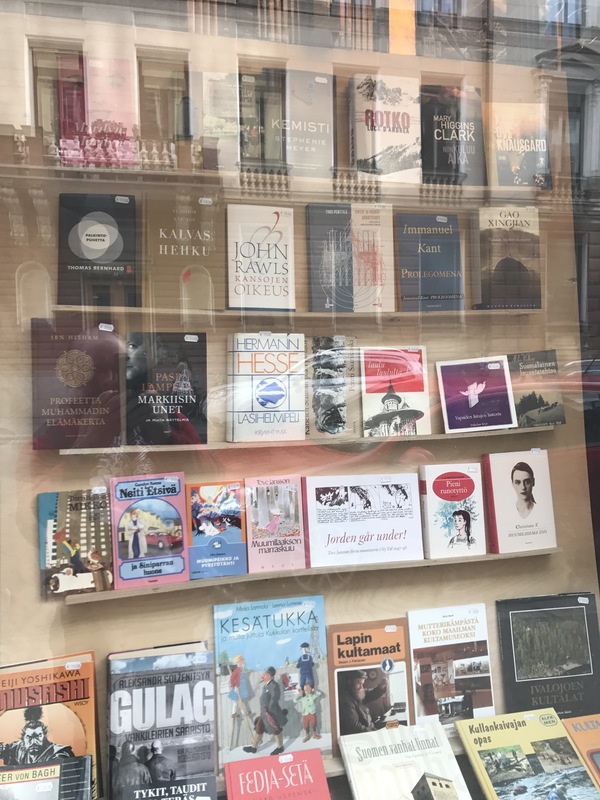 Look at this library, for example, and the number of philosophical works translated into Finnish. Finally, if you have the time (and make it if you don’t have it), go and visit the marvelous little museum of Sinebrychoff, which boasts a small, but exquisite collection of classical European art. They even boast a Rembrandt in their collection! 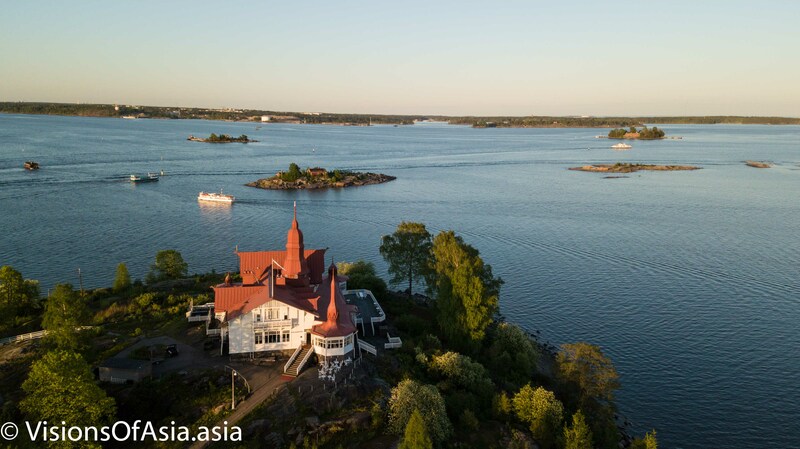 In summer, finally, an unforgettable experience is to wake up at 3 AM and go and see the midnight sun on Helsinki’s harbor. See below for an idea of what it is like. How to go there? Well, the obvious answer would be to catch the Finnair flights which take you there from any corner of the world and enjoy as well the Finnish welcome as soon as you board the aircraft. Otherwise, plenty of solutions are available to go to Helsinki from Europe (even a week-end or a day trip is largely worth it).